I am currently a researcher in Microsoft Research AI, where I moved to after six wonderful years in the NYC lab of Microsoft Research. Prior to that, I obtained my PhD in Computer Science from UC Berkeley, working with Peter Bartlett and Martin Wainwright. I am broadly interested in Machine Learning and Reinforcement Learning. For more detailed information, please visit my personal webpage at http://alekhagarwal.net/. 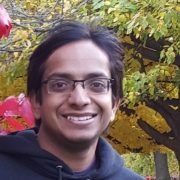 Alekh Agarwal has been a co-organizer of the NIPS workshop on Optimization for Machine Learning from 2010 through 2015. He has been an area chair or equivalent for ICML (2013, 2015, & 2016), COLT (2013, 2015), AISTATS (2013), and NIPS (2013). He serves as a reviewed for several journals, including JMLR, Annals of Statistics, IEEE Transcations on Automatic Control, IEEE Transcations on Info Theory, SIAM Journal on Optimization, and Machine Learning.